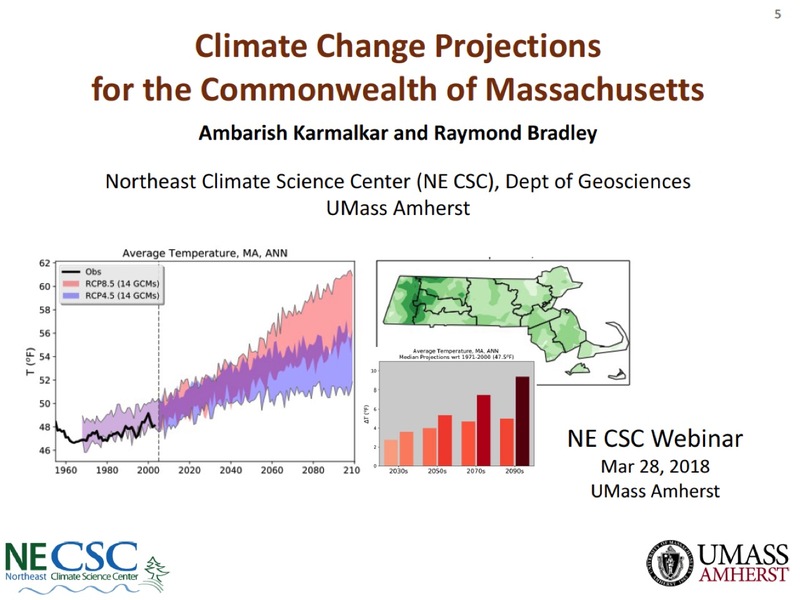 Supporting Climate Adaption Planning for the Commonwealth of Massachusetts: What Surprising Changes will Occur to our Climate, Sea Level and Water Resources? This talk will be in Morrill Science Center II, Room 134. To join the webinar online, follow the link above. Webinar ID: 406-446-629. This webinar does not require a password or registration. Participation is on a first-come, first-served basis. On September 16 of 2016, Governor Baker of Massachusetts signed Executive Order No. 569 in which he committed the Commonwealth to publish a statewide adaptation strategy that would incorporate observed and projected climate trends to provide guidance on the topics of “extreme weather events, drought, coastal and inland flooding, sea level rise and increased storm surge, wildfire, and extreme temperatures.” Since that time, the Massachusetts Executive Office of Energy and Environmental Affairs engaged members of the faculty and staff at the University of Massachusetts, including the Northeast Climate Adaptation Science Center, to collaboratively develop models and information that can be used to inform planners, managers, and the general public about the likely impacts of climate change. A primary goal of this research was to develop information that can be appropriately communicated and that can inform the state and its partners in achieving the goals of EO 596. In this seminar, the initial results of these studies will be discussed including projections of changes in our climate, changes in our water resources, and estimates in sea level rise.